The ADMAG Total Insight(TI) series ADMAG AXG adopts the "Total Insight" concept and totally support the product life cycle. The ADMAG Total Insight series AXG electromagnetic flowmeter is a high-quality and highly reliable product developed based on years of experience and achievement, such as enhancement of application by our proprietary dual frequency excitation method. The AXG is ideal for industrial process lines like oil & gas/chemical/pulp & paper/food & beverage/metal & mining applications. With outstanding reliability and ease of operation and maintenance, developed on decades of field-proven experience, the AXG will increase your benefits while reducing total cost of ownership. process lines like oil & gas / chemical / pulp & paper / food & beverage / metal & mining applications. With outstanding reliability and ease of operation and maintenance, developed on decades of fi eld-proven experience, the AXG will increase user benefi ts while reducing total cost of ownership. The sizes are available from 2.5 mm to 500 mm (0.1 to 20 in.). For lining, fluorocarbon PFA or ceramics tube which can be applied to severe applications can be selected. Process connection also supports various specifications such as ASME, EN, AS, and JIS. 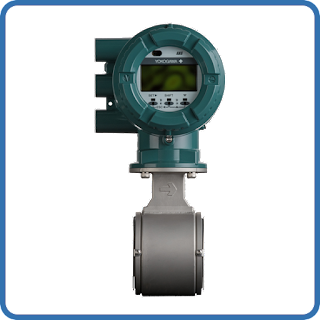 Our own dual frequency excitation method realizes stable flow measurement even under high flow noise in the fluid with inhomogeneous conductivity or highly concentrated slurry. calculation using temperature input is available. Operation authority level setting for ensuring safety, process data trend display, display backlight flashing (Squawk) function, and data store / restore function with display unit internal memory or microSD card are available. Diagnostic functions that contribute to preventive maintenance of the plant are equipped. Diagnosis of the device (built-in verification function) that can be executed without demounting from piping, detection of the process condition by monitoring the flow noise and electric conductivity of the fl uid, electrode insulation deterioration diagnosis, electrode adhesion diagnosis, and wiring connection diagnosis areavailable. By applying the occurrence of electromotive force proportional to the flow velocity when fluid moves in the magnetic field, the meter can measure the flow velocity of conductive liquid. 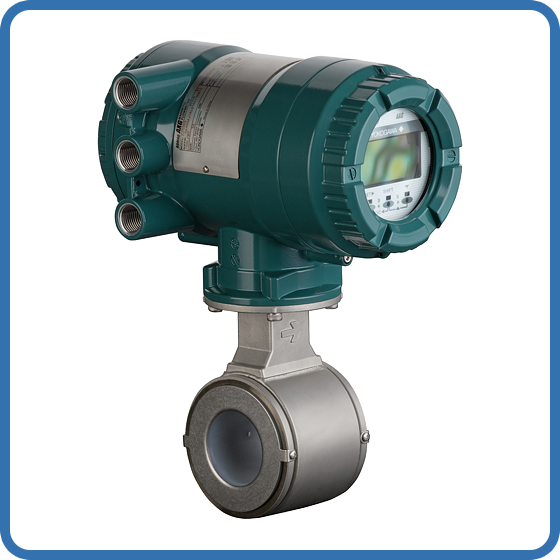 It calculates the instantaneous flow rate, integrated flow rate, etc. from the measured flow velocity. transmits the signal. Structurally, there is an integral type of sensor and transmitter, and a separate type which is separated. In the separated type, the signal cable for the flow signal and the excitation cable for the coil excitation are added to the constituent elements. 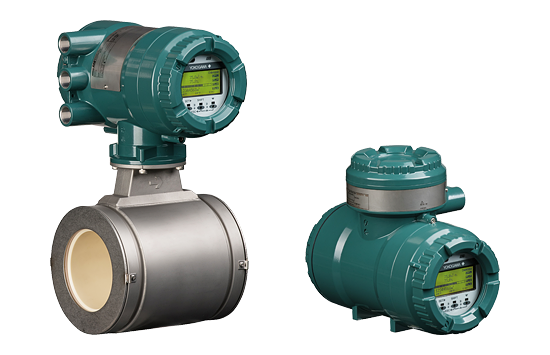 The sensor part and the transmitter part for the integral type are simply referred to as a sensor and a transmitter respectively. 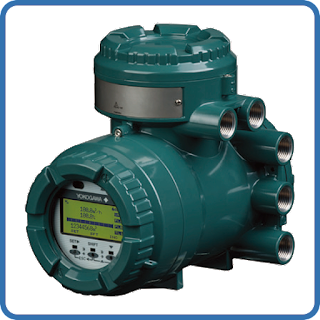 The integral type is also called as an integral type flowmeter. As for the components of separate type, they are also called as a remote sensor and a remote transmitter. Lining (including ceramics tube), Electrodes, Grounding devices (Grounding rings plate type, Grounding rings electrode type, Built-ingrounding electrodes), Piping adapters (for hygienic use) Note: Grounding devices are to take the reference electric potential from the process fluid to measure the electromotive force from the process fluid, and they are fixed (or built in) at two locations upstream and downstream of the flow. They are unnecessary when taking the reference potential from customer piping. Please also refer to "Cautions on Selection and Installation".